During last Gaza conflict – on summer 2014 – I wrote about some peculiarities in then ongoing operation “Protective Edge” (Peculiarities of Operation Protective Edge ) on comparison to the earlier Gaza conflicts/wars. One of the main issues then and earlier has been discussion/debate/media-war related to civilian deaths during Israeli operations (e.g. Minimizing Collateral Damage In Gaza Conflict ). After the conflict the discussion about civilian deaths and “war crimes” has continued. From its side Israel has made research about this (look e.g. Additional findings in the examination of the names of Palestinians killed in Operation Protective Edge – Part Eight ). Recently Associated Press published its investigation claiming that during Operation Protective Edge, at least 844 Palestinians were killed as a result of airstrikes on homes (more in YNet news ). Now Col. Richard Kemp, the former top UK commander in Afghanistan, submitted to UN investigators his views on Operation Protective Edge. Richard Kemp has spent most his life fighting terrorism and insurgency, commanding British troops on the front line of some of the world’s toughest hotspots, including Afghanistan, Iraq, the Balkans and Northern Ireland. He provides strategic consultancy services on leadership, security, intelligence, counter-terrorism and defence. I was a Colonel in the British Infantry. Much of my 29 years’ military service was spent countering terrorism in Iraq, Afghanistan, Northern Ireland, Great Britain, Germany, Saudi Arabia and Macedonia. I was Commander of British Forces in Afghanistan in 2003. I fought in the 1990-91 Gulf War and commanded British troops in Bosnia with the UN Protection Force and in Cyprus with the UN Force. From 2002 – 2005 I was seconded to the UK Cabinet Office working on intelligence relating to international and domestic terrorism. Hamas and Palestinian Islamic Jihad were among the extremist groups that I monitored and assessed in this role, and I had access to all secret intelligence available to the UK on these and other Palestinian extremist groups. I was appointed Member of the Order of the British Empire by the Queen in 1994 for counter terrorist intelligence services and Commander of the Order of the British Empire in 2006 also for counter terrorist intelligence services. I was in Israel for much of the summer 2014 Gaza conflict, specifically from 14 July – 8 August and from 27 August – 5 September. During these periods I met, was briefed by and questioned Israeli political leaders, senior officials and Israel Defence Force (IDF) soldiers from general officer down to private soldier. I spent a considerable amount of this time close to the Gaza border where I also met, was briefed by, questioned and observed many IDF officers and soldiers immediately before and after they had been in combat. I was in Israel also for much of the Gaza conflict in 2012. I visited IDF units and held meetings with many IDF officers, government officials and political leaders before and since then. I have been acquainted with the IDF and the Israeli intelligence services for many years, both during and after my military service. This submission to the UN Commission of Inquiry on the 2014 Gaza conflict is based on observations on the ground during the conflict, 29 years’ military experience of conflicts of this type, intelligence work relating to Hamas and Palestinian Islamic Jihad, knowledge of the IDF and Israeli intelligence services, study of the Israel-Palestine conflict and observations on the ground during the 2012 Gaza conflict. I should add that I have no formal, paid or unpaid, connection with the IDF or with any other organ of the Israeli government. In my opinion the actions taken by the IDF were necessary to defend the people of Israel from the ongoing, intensive and lethal attacks by Hamas and other groups in Gaza. It is the inalienable duty of every government to use its armed forces to protect its citizens and its terrain from external attack. In this case there was a sustained assault on the Israeli population from rockets and mortar bombs; attacks on Israeli military posts using tunnels; apparent plans to launch further attacks on Israeli military posts and on civilian settlements also using tunnels; and attempted attacks from the sea. As the Gaza Strip is effectively a separate state, outside of Israeli control, these actions amounted to an attack by a foreign country against Israeli territory. In these circumstances I know of no other realistic and effective means of suppressing an aggressor’s missile fire than the methods used by the IDF, namely precision air and artillery strikes against the command and control structures, the fighters and the munitions of Hamas and the other groups in Gaza. Nor have I heard any other military expert from any country propose a viable alternative means of defence against such aggression. A strategy of carpet-bombing to force Hamas and the other groups to desist from their attacks. A large-scale ground invasion to find and destroy the offensive capabilities of Hamas and the other groups. Either of these means would have resulted in far greater civilian casualties, and a ground invasion would also have incurred significant numbers of Israeli military casualties. The destruction of Hamas would also have left Gaza under full Israeli control, which would have needed an investment in military resources that Israel could ill afford given the wide range of threats and potential threats that the country faces, including from Iran, from Hizballah in Lebanon and Syria, from the Islamic State in Syria and from Islamist extremists in Sinai. In reality, the offensive missile capabilities of Hamas and the other groups could never have been totally destroyed using air operations alone. Recognising this, the IDF commanders and their political leadership calculated that to have eradicated the threat completely would have required a ground offensive that would have caused large numbers of casualties among Gaza civilians – far more than were sustained during the operation in the summer. They also took account of predicted Israeli military casualties which would have been substantial. The consequence was an acceptance that while it would be possible to halt Hamas’s aggression on a temporary basis, there would in the future be a resurgence of such activity, forcing yet another defensive operation along the lines of 2008-09, 2012 and 2014, and causing further Israeli and Palestinian casualties. Though unsatisfactory in the longer term, this was a proportional and pragmatic response – indeed in my opinion the minimum possible response – to the rocket fire from Gaza. While Israel can act to reduce the prospects for such future action, including by trying to prevent munitions or materiel with the potential for offensive military use entering Gaza, it cannot fully achieve this. In the interests of a lasting peace I would strongly urge the Commission to recommend effective international cooperation against the continued re-militarization of the Gaza Strip. It is grossly irresponsible of international actors to rely on accusations against Israel of a so-called illegal blockade and occupation of Gaza, and demand that Israeli control of Gaza’s borders be lifted, when it is clear that Israeli action is necessary to prevent the re-armament that will lead to further attacks by Hamas and other groups. It should be noted that Egypt takes similar preventive action against Gaza extremists for the same reason as Israel. In the absence of effective international pressure and cooperation there is certain to be another Gaza conflict in the coming months and years. 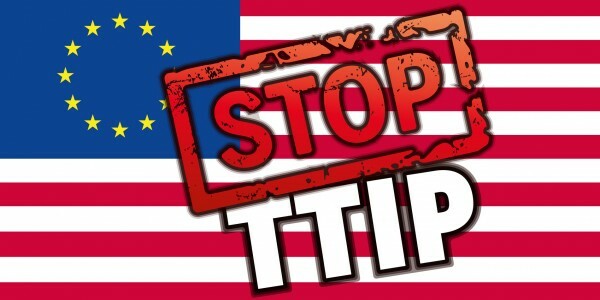 This Commission could play a constructive role in advocating an international approach in order to avert further conflict. Equally, in my opinion the IDF had no alternative than to conduct a limited ground incursion into the Gaza Strip to locate and destroy the attack tunnels that directly threatened Israeli people and territory. This could not have been achieved from Israeli territory alone, especially given the fact that close reconnaissance on the ground inside Gaza was necessary to identify the locations of the tunnels. Nor could the tunnels have been identified or neutralized from the air without ground forces. If, as I am asserting, it was necessary for Israel to conduct military action to defend its people against attack from Gaza; and if, as I am also asserting, the IDF conducted, in general terms, the most appropriate form of operations, namely precision air and artillery strikes against the command and control infrastructure and the missile launching infrastructure, and a limited ground incursion to locate and destroy the tunnels; the question then arises as to how these operations were conducted in relation to the Laws of Armed Conflict. Much of the Hamas military infrastructure was located amongst the civilian population in Gaza. In these circumstances, neutralizing the threat from Hamas made civilian casualties unavoidable. Under the Laws of Armed Conflict this fact does not render such operations illegal assuming they were necessary. However the IDF had a duty to distinguish between legitimate military targets and civilians and to ensure that operations were conducted in accordance with the principle of proportionality as well as necessity. It is worth emphasizing that proportionality is not, as often believed by critics of Israel, a relationship between the numbers of casualties on either side in a conflict, but a calculation that considers whether the incidental loss of civilian life, injury to civilians or damage to civilian objects would be excessive in relation to the concrete and direct military advantage anticipated in an attack. From my own research as well as briefings from and discussions with Israeli legal, military and political leaders, I understand and know well the ethos and operating principles of the IDF and I know that their commanders place great emphasis on adherence to the laws of armed conflict. This includes the principle of proportionality, which is set out in Israel’s manual of military law and is recognized by the International Committee of the Red Cross. The IDF is accountable to the democratically elected government of Israel and also to the Israeli legal system. The laws of Israel require adherence to the laws of armed conflict as well as domestic military and civilian criminal law. The Israeli military and civilian legal systems – both widely respected by international legal authorities – are empowered to take appropriate action against IDF personnel who transgress domestic or international law. There are numerous examples of such action in relation to previous conflicts. I am aware that such processes are currently underway in relation to the 2014 conflict. As with all Western armed forces the IDF codify the relevant laws into rules of engagement that determine when Israeli military personnel may or may not use lethal and less than lethal force and into regulations that govern military conduct in relation to treatment of civilians, enemy combatants and property in an operational area. As with British and US rules of engagement, in normal circumstances IDF rules of engagement keep the IDF soldier within the laws of armed conflict by a significant margin. All Israeli soldiers are trained on these rules and regulations and the IDF emphasizes continuous updating of this training for their troops. I have frequently questioned senior and junior IDF personnel on these issues and I have found that communication of these directions is effective. In my experience the most junior soldiers in the IDF understand them and the imperative of adhering to them in conflict. I questioned Israeli commanders and soldiers on the ground on their actions in combat on the Gaza border immediately before and immediately after they were fighting in Gaza and during ceasefire periods. I spoke to soldiers from infantry, tank, artillery and engineer forces. Many of them expressed frustration at the restrictions imposed upon them by the rules of engagement, in the same way as British, US and other Western soldiers express such frustration. This was generally explained to me as frustration due to the additional risks imposed on their own lives and the lives of their fellow soldiers and also on the reduction in effectiveness against an enemy brought about by adherence to the highly restrictive IDF rules of engagement. The latter relates to restrictions that I was told frequently allowed enemy fighters to escape rather than take the risk that innocent civilians might be killed. Nevertheless all of the soldiers that I questioned – including those who claimed they were frustrated by these restrictions – accepted and understood the need to adhere to the rules and told me that they and their comrades did adhere to the rules during combat in Gaza. I found this level of acceptance to be higher than would generally be found among soldiers from other Western armies that I have commanded or served alongside. The expressions of frustration also, in my view, tend to confirm adherence to the rules of engagement – even though they didn’t necessarily like the rules they still apparently complied with them. Many soldiers that I questioned told me about encounters with Palestinian fighters among the civilian population and the steps they had taken to avoid civilian casualties. Soldiers told me that not only were they not permitted to kill, wound or mistreat innocent civilians but also that their own morality would not allow it. For example, one engineer soldier who had recently emerged from a Hamas attack tunnel told me that even while advancing along the tunnel, faced by a wide range of potential threats to his life, uppermost in his mind was the need to avoid killing innocent civilians. He explained that he knew Hamas sometimes used innocent civilians as human shields in the tunnels. I spoke to a group of IDF pilots who had that morning been flying attack missions against fighters in the Gaza Strip. Again all of them knew, understood and accepted the rules of engagement that applied to them. The level of frustration was reduced, partly because they were in less personal danger than troops on the ground. One of them told me that he had attempted to attack a Hamas target that morning but had aborted the attack because civilians had been identified in the target area. He told me that he had made 10 further attempts to attack the same target and each time the attack was aborted due to the presence of civilians. Eventually he abandoned the mission altogether. I asked him whether he found this frustrating. He said he did not. He told me that “the best thing about the IAF (Israeli Air Force)” was that they were not allowed to strike a target if they knew civilians were present in the target area. He said that whatever the rules and the laws, in any case he could not live with himself for the rest of his life if he had knowingly killed innocent civilians. Although I did not witness these events personally I know and understand soldiers, having been a soldier myself and commanded soldiers for 29 years. I know how they think, act and speak. I would know if I was being deceived or misled in such discussions. I do not believe that this was the case and I therefore consider that the comments made to me by IDF soldiers immediately before and after combat were truthful. This was by no means a scientific survey, but my questioning covered a large number of soldiers from a very wide range of IDF units, at different times and in different circumstances and I believe it to be indicative of the true overall ethos of the IDF. Of course this does not mean that no soldier breached the rules of engagement at any time, whether deliberately or by error. And it does not mean that mistakes were not made that resulted in civilian casualties. I will refer to this later. I have been briefed in detail on the procedures used by the IDF to avoid civilian casualties in Gaza during the 2014 conflict. I previously commented in relation to the 2008-09 Gaza conflict that no army in the history of warfare had taken greater steps than the IDF to minimise harm to civilians in a combat zone. My observations during the 2014 conflict confirmed this. No other army that I have served in or alongside or that I have studied and researched has yet taken such extensive precautions. This includes British and US forces. It is in part due to the specific circumstances of the Gaza conflict, which allow the IDF to go to such lengths whereas other armed forces in other situations may not be able to do so. However, during some operations in Afghanistan, British and US forces adopted some methods developed by the IDF in Gaza. And in November 2014, General Martin Dempsey, Chairman of the US Joint Chiefs of Staff, said that the IDF ‘went to extraordinary lengths to limit collateral damage and civilian casualties’ during the 2014 conflict in Gaza. He revealed that he had sent a delegation of US military officers to Israel to learn about the measures that the IDF took to prevent civilian casualties. Israel’s emphasis on preventing civilian casualties during this conflict started at the top. 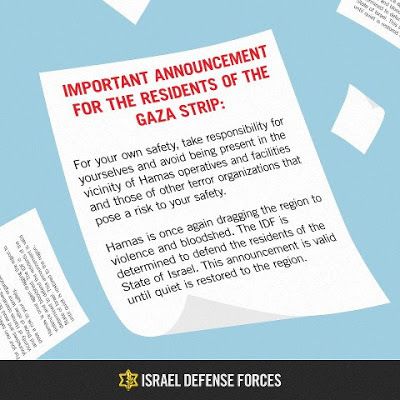 The Prime Minister, the Minister of Defence and the Chief of Staff of the IDF made clear their directions that civilian casualties were to be minimised. I was told that the first item on the agenda of every meeting of the Israeli security cabinet during the conflict was Palestinian civilian casualties. This illustrates the priority placed by all elements of the Israeli government engaged in the conflict on minimising civilian casualties in Gaza. This flowed down from top to bottom. On questioning military personnel at all levels I found that even the most junior private soldiers on the ground understood and said they complied with this priority. I was briefed on the following procedures that were routinely implemented prior to launching an attack in Gaza. Before a target could be attacked at least two separate and independent intelligence sources had to verify that it was a legitimate military target. Intelligence includes human sources, aerial surveillance, ground surveillance and communications intercept. Each separate aerial attack mission had to be personally authorised by the Commander of the Israeli Air Force or one of his deputies, at least one of whom had to be present in the operations centre throughout the conflict. Authorisation was also subject to legal advice. To confirm whether or not civilians were in the target area surveillance had to be conducted by both manned combat aircraft and unmanned air vehicle (drone), the latter enabling greater visual recognition. An additional measure was the use of a specially designed harmless air-dropped munition known as ‘knock on the roof’ which was dropped on buildings to make a loud percussion and to warn those inside of an impending attack. Further surveillance was then conducted to confirm the civilians had left the target area. If they had not the attack would not be carried out until they had. Once a pilot was authorised to attack he had authority – and it was his duty – to abort the attack if he had reason to believe civilians were present when he made his attack run. Pilots utilising lazer-guided munitions were required to identify a safe open area in advance so that if civilians were identified in the target zone even after the missile was launched, it could be diverted in flight to the safe area. I make the assumption that in some circumstances all of these procedures could not be followed, for example in an air operation in support of ground forces in danger. This might require more rapid action than these procedures would allow. All of the procedures described above were not of course applicable to ground operations although the principles that brought them about did apply, namely the need to avoid or minimise civilian casualties. A further consideration for ground operations was the safety of the IDF’s own forces. This factor was less significant in relation to pilots, to whom the danger from enemy fire was greatly reduced. As any military commander must minimise the risk of civilian casualties in a combat zone so he must also minimise the risk of casualties to his own forces for moral reasons, because of his duty of care and for reasons of fighting morale and combat effectiveness against the enemy. This is often overlooked when investigating human rights issues in a conflict. But every military commander must take this factor into account when calculating necessity and proportionality in his decision-making. This consideration is an important factor that affects the extent of civilian casualties in ground combat, including in Gaza, and will sometimes lead to increased civilian casualties. A further factor is the inaccuracy of some ground combat systems compared to air systems, for example the infantry assault rifle compared to precision-guided munitions. Additionally even the best trained ground forces are inevitably affected by fear, exhaustion, pain, smoke, noise, enemy fire, disorientation, sensory distortion, confusion and death and destruction around them. In a combat situation there can be so many moving parts and so much chaos that inevitably errors occur and some of these lead to unintentional civilian casualties. A further likely cause of civilian casualties – both from the air and the ground – was equipment malfunction. Weapon guidance systems fail, computers fail, surveillance systems fail, communications fail or are distorted, explosives act aberrantly. There is also non-combat related human error. This applies in all human activities and in all walks of life and it also applies in military operations. It is possible that this was the cause of some of the casualties in Gaza. Nor is intelligence a perfect science – far from it. Undoubtedly there will have been cases where IDF commanders believed that an area was free of civilians. There will also have been cases where commanders believed civilians to be fighters. This circumstance is difficult to avoid when an enemy is uniformed; far more difficult when fighters such as Hamas do not wear a uniform and indeed deliberately endeavour to appear to be civilians. None of these things are inherently wilful and therefore their consequences are unlikely to be criminal in nature. Anybody who doubts the relevance of these factors need only consider friendly fire incidents that occur on virtually all battlefields even with 21st Century technology. A number of IDF deaths were caused by friendly fire during this conflict. It is hardly likely that these would have been deliberate. They were also likely the result of battlefield conditions, human error, weapon inaccuracy and technical failure. However, as with all armies the IDF have bad soldiers. Wilfully or through carelessness or negligence, such individual soldiers may have been responsible for some civilian casualties and for other wrongdoing such as ill treatment of civilians or fighters or damage to property, looting and theft. Such actions may be criminal and may have led to war crimes or offences against military discipline during this conflict. I have been briefed in detail on the IDF system of fact-finding, learning lessons for the future, investigation and criminal and military legal action against offenders. This system is not exclusively an internal military process; the Supreme Court of Israel oversees it. It is a system that enjoys wide respect among international legal authorities. In addition to the IDF’s policy of minimising civilian casualties during this conflict, other Israeli actions significantly contributed to saving the lives of Gaza civilians. The considerable Israeli financial and technological investment in the Iron Dome counter missile system prevented the majority of missiles fired out of Gaza that would have hit population centres from killing and wounding civilians and destroying property. The sophisticated monitoring, warning and shelter system put in place by Israel saved the lives of many Israeli civilians. Both also provided some reassurance to the Israeli civilian population under intensive fire from Gaza. Without these systems being in place, in my opinion the many salvoes of rockets fired from Gaza during the summer of 2014 would have killed and wounded perhaps hundreds of Israeli civilians and caused widespread panic among the population. In such circumstances it is likely that the Israeli government would have had no option other than to launch a large-scale ground offensive, in concert with the air operation against Hamas and other groups in Gaza. This would have led to many more casualties among Gaza civilians and it can therefore reasonably be asserted that Israeli investment in these systems not only saved the lives of Israelis but also of Gaza civilians. Despite Israeli efforts to save civilian lives it is estimated that a significant number of those killed in Gaza were civilians. Total estimates of deaths in Gaza during the conflict range from around 2,100 to around 2,200. The estimated proportion of those who were non-involved civilians varies considerably. The Gaza ministry of health, controlled by Hamas, asserts that a significant majority, at least 70%, were civilians. The UN OCHA puts the figure at over 67%. The Meir Amit Intelligence and Terrorism Information Center, an independent research group based in Israel, currently estimates that approximately 48% were civilians. Whereas the other estimates are based on information supplied by Hamas, this estimate is based on systematic analysis of information gleaned from social media and other sources but is as yet incomplete. Of all the civilians who died during the conflict, some died of natural causes, some in accidents not related to the fighting, others were reportedly executed or murdered by Hamas and other groups and still others were killed accidentally by Hamas missiles that were intended to kill Israeli civilians but fell short and landed in Gaza. Undoubtedly many of those who were killed as a result of Israeli military action died due to Hamas’s way of fighting, including the use of human shields (see below). Taking these factors into account I would urge the Commission to exercise caution over attribution of Gaza civilian casualties at this stage as the picture is far from clear. I would also recommend that the Commission examines the ratio of civilian to combatant casualties in other comparable conflicts. Accurate and reliable information is understandably hard to obtain, though the UN Secretary General has estimated that on average the ratio in this form of conflict since the Second World War has been 3 civilians for every combatant killed. In Afghanistan the estimate is 3:1. During the Iraq conflict that began in 2003 the UN estimate was 4:1. Other studies estimate far higher civilian casualty rates in these and other conflicts. Turning now to Hamas’s conduct in the 2014 conflict. During my time in Israel during this conflict I witnessed what I believe to be a series of war crimes and planned war crimes by Hamas and other Gaza groups, both by missile attack against civilians and by construction of attack tunnels from which to kill and abduct civilians. I am also aware of, but did not witness, Hamas and other groups’ use of their own civilian population as human shields. I personally observed 19 separate missile attacks, some involving multiple missiles, fired at Israeli population centres. Hamas do not possess the capability to carry out precision attack using missiles and therefore these attacks were all indiscriminate, and therefore unlawful under the Laws of Armed Conflict, carrying the risk of killing or wounding innocent civilians and causing damage to civilian property. My own life, as a visitor to Israel, was also in danger during many of these attacks. Of these 19 attacks, 18 were, to my knowledge, intercepted and destroyed by the IDF’s Iron Dome system or exploded in unpopulated areas. One was a direct hit on a house causing severe damage to property. These incidents are detailed below. 14 July, 1700 hours – I observed Iron Dome intercept a rocket over Tel Aviv. 15 July, 1900 hours – I observed Iron Dome intercept two rockets over Tel Aviv. 16 July, 0920 hours – I heard what was apparently Iron Dome interceptions of rockets over Tel Aviv. 16 July, 1325 hours – I observed rockets in the area of Sderot. 16 July, 1445 hours – I observed Iron Dome intercept a rocket over Be’eri. 16 July, 1515 hours – I observed Iron Dome intercept a rocket over Be’eri. 16 July, 1518 hours – I observed rockets in the vicinity of Ashkelon. 17 July, 2207 hours – I observed Iron Dome intercept two rockets overhead Tel Aviv. 18 July, 1558 hours – I observed Iron Dome intercept rockets overhead Tel Aviv. 18 July, around 2000 hours – In vicinity of Reim I observed numerous outgoing rockets launched from Gaza. 22 July, 1003 hours – I observed Iron Dome intercept two rockets overhead Tel Aviv. 22 July, 1105 hours – I observed two rockets apparently explode in the sea off Tel Aviv beach. 24 July, 1118 hours – I observed four rockets overhead Tel Aviv. 25 July, 1048 hours – I observed rockets overhead Tel Aviv. 26 July, 1952 hours – I observed Iron Dome intercept rockets overhead Ashkelon, breaking cease-fire. 29 July, 2213 – I observed Iron Dome intercept a rocket overhead Tel Aviv. 2 August, 0600 – I observed Iron Dome intercept a rocket overhead Tel Aviv. 3 August, 1502 – I observed Iron Dome intercept a rocket, possibly two, overhead Tel Aviv. 8 August, 0715 – I was on board a plane at Ben Gurion International Airport when flying was suspended as a result of rocket fire, in violation of a ceasefire. I did not hear or observe any rockets. During the majority of these incidents I witnessed the trauma and fear for their lives that was deliberately imposed by Hamas and other groups on innocent Israeli civilians, men, women, children and old people, as well as visitors from outside the country. I also observed the disruption to daily life caused by these attacks. In the area of Israel around Gaza, this disruption was most severe, compounded by the high frequency of attacks. On 16 July I visited the home and consulting rooms in Ashkelon of an Israeli doctor shortly after it had sustained a direct hit from a missile fired from Gaza. I was told that often the doctor’s waiting room would be filled with young children. The missile caused severe damage to the house including this waiting area. Fortunately no children were present at this time. The only occupant was the 17-year-old daughter of the doctor. I questioned her and she told me that when she heard the attack siren she only just made it to the reinforced shelter area before the missile exploded in the house, throwing blast and debris into the room where she had been sitting and causing partial structural collapse. I have seen the effects of many explosions and in my opinion had she not reached the shelter in time she would very likely have been killed or severely wounded by shrapnel, blast, debris and flying splinters of glass. I know of the deliberate policy of using human shields, including women and children, which is also a war crime, by both Hamas and Palestinian Islamic Jihad. I am aware of this as a result of my previous British government work involving secret intelligence on these groups, from public statements made by the Hamas leadership on a number of occasions since the 2008-09 Gaza conflict, from media reports including film footage showing such action and statements by individuals forced to remain in declared target areas, from publication of training manuals found in Gaza by the IDF and from debriefing of IDF personnel and journalists. From the same sources I am also aware of Hamas’s use of buildings and vehicles protected under the Laws of Armed Conflict including schools, hospitals, UN buildings, mosques and ambulances. Use of such facilities for military purposes constitutes a war crime. During the conflict I visited and entered an attack tunnel which ran from the Gaza Strip into Israeli territory. This tunnel had been expertly constructed with concrete walls, ceiling and floor. It had rail lines running along the floor, ducted power cabling along the walls (imprinted, incidentally, with Hebrew lettering), lighting and electric motors built into the walls. The tunnel emerged within a few hundred metres of an Israeli civilian community. This tunnel, along with many of the others located by the IDF, could only have been designed with one purpose in mind: to infiltrate Israeli territory to attack, kill and abduct Israeli civilians and soldiers. In conclusion, in my opinion the IDF took exceptional measures to adhere to the Laws of Armed Conflict and to minimise civilian casualties in Gaza. During the conflict many politicians, UN leaders, human rights groups and NGOs called on the Israelis to take greater action to minimise civilian casualties in Gaza. Yet none of them suggested any additional ways of doing this. I conclude that this was because Israel was taking all feasible steps. I believe Israel to be world leaders in actions to minimise civilian casualties; and this is borne out by the efforts made by the US Army, the most sophisticated and powerful in the world, to learn from the IDF on this issue. In my opinion Israel is also making strenuous efforts to investigate incidents where civilians were apparently unlawfully killed, wounded or ill-treated, and where civilian property was unlawfully damaged or stolen. I am not aware of any nation that has conducted more comprehensive or resolute investigations into its own military activities than Israel during and following the 2014 Gaza conflict. On the other hand, Hamas and other groups in Gaza took the opposite approach to that of the IDF. Their entire strategy was based on flouting the Laws of Armed Conflict, deliberately targeting the Israeli civilian population, using their own civilian population as human shields and seeking to entice the IDF to take military action that would kill large numbers of Gaza civilians for their own propaganda purposes. There was and is of course no accountability or investigation of any allegations against Hamas and other extremist groups in Gaza. I strongly urge the Commissioners to condemn Hamas and the other groups for their actions during this conflict. Failure to do so would be tantamount to encouraging a repeat of such actions in the future, by Hamas and other Gaza groups and by extremist groups around the world who would wish to emulate the actions in Gaza. This would undoubtedly result in further loss of life in Gaza, in Israel and elsewhere. Similar encouragement is given to extremist groups by the lamentable tendency of some international actors to afford moral equivalence to Hamas, an internationally proscribed terrorist organization, and Israel, a liberal democratic state. I also urge the Commissioners to give fair consideration to Israel’s actions during this conflict and not simply to jump on the over-burdened bandwagon of automatic condemnation. Where the actions of the IDF were genuinely wrong then of course the Commission should criticise them, call upon them to bring the perpetrators to justice where appropriate and to adjust future procedures as necessary. But false accusations of war crimes, as were made by the Commissioners that investigated the 2008-09 Gaza conflict (the ‘Goldstone Report’), will do nothing to advance the cause of peace and human rights. Instead, such accusations will encourage similar action by Hamas and other groups in the future, leading to further violence and loss of life. Many people believe that your findings are a foregone conclusion, as the findings of the 2008-09 Commission regrettably proved to be. They believe that you will roundly and without foundation condemn Israel for war crimes while at best making only token criticism of Hamas and other Gaza extremist groups. If you genuinely want to contribute to peace and to improve human rights for the people of Gaza and of Israel then you must have the courage to reject the UN Human Rights Council’s persistent and discriminatory anti-Israel programme and produce a balanced and fair report into these tragic events. EU and Russia: No option but peace and coexistence | The BRICS Post. The greatest exodus from Kosovo since the 1998-99 war has started. More than 15 years after NATO bombing Kosovo is witnessing a dramatic surge in the number of its citizens smuggling themselves across Serbia’s border into Hungary and push westwards to the likes of Germany and Switzerland through the EU’s borderless Schengen zone. Since August 2014, when exodus from Kosovo began, until last December, it is estimated that about 100,000 people has left Kosovo, and from the beginning of this year 50,000 more, although no one officially wants to say it, writes Pristina daily “Bota Sot”. That is six per cent of population. Hungary and Austria have both reported a sudden rise in migration from Kosovo. In only two months between 50,000 and 120,000 ethnic Albanians have left Kosovo in a wave migration to western European countries. The Kosovar media has reported that as many as 20,000 people are leaving the tiny country of around two million people each month in a bid to escape corruption, poverty and soaring unemployment. The Hungarian Embassy in Kosovo estimates the number of Kosovo Albanians in Hungary could be as high as 60,000, according to Balkan Insight. The education ministry of Kosovo released on mid-February “alarming statistics” showing that 5,200 children dropped out of school in recent months to follow their parents abroad. In addition 60,000 Kosovo Albanians applying now for Serbs passport as they need visa for Schengen area but Serbs not. On 12th Feb 2014 Serbian security forces stepped up patrols and deployed an elite unit on its border with Hungary, trying to halt a torrent of migrants that has triggered alarm in many European Union countries. 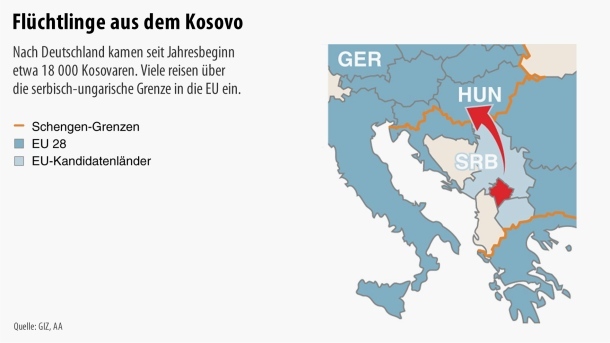 One consequence about this exodus especially in Germany and Austria is that Kosovo Albanians are blocking space and services from those asylum seekers who have real need to flee from their homeland, e.g. Syria and Iraq. Why now? The reason for leaving now, according to many of the migrants, is an easing of the travel restrictions, which used to prevent them leaving Kosovo, and travelling across Serbia. 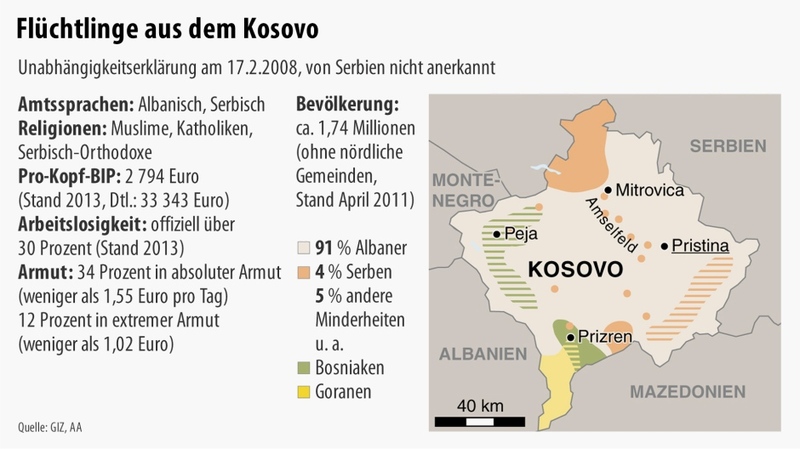 One should note that especially Germany has demanded improvement of cooperation between Serbia and Kosovo. One part of cooperation is that Kosovo Albanians can travel with their ID to borders and then to try illegally enter to EU. Also migrants spoken to by Reuters reporters suggest smugglers have found safer routes across the border, and word of mouth has triggered an exodus. According to the UN, 35 percent of people in Kosovo are unemployed and nearly 30 percent of the country lives in poverty. After elections Kosovo got last December new government and since then more and more Kosovo Albanians are trying to escape from their country. It seems that Kosovo Albanians have lost all hope for better living in Kosovo – poverty and a lack of prospects might be two reasons why they’re searching better future from Germany. But the unemployment may not be the main cause for emigration. In a matter of few weeks the Pristina-based construction company “Pozhegu Brothers” has witnessed a sudden decline of its workforce in a wave of illegal emigration that has hit Kosovo in recent months. The company says that it has lost 40 members of its workforce for the purpose of emigrating for a better life and prosperity into a European Union (EU) country. They stress that each of them was a qualified and experienced worker, and in terms of financial sustainability each of them earned between 350 and 600 euros a month. Other companies and businesses are reporting the same problem of workforce resigning from jobs for emigrating purposes. (Source: ShanghaiDaily ) For me this sounds very strange as in Balkans and especially in Kosovo 350-600 € per month is really good salary. On the other hand a couple of years ago I was informed that that poor people from Bulgaria came to pick grapes to Kosovo as the local ones did not accept so low compensation as paid for that that job. Poverty seems to be relative issue. Here one excerpt from BBC-story: “It started last summer as several dozen a day. Now it is several thousand a day,” says Laszlo Torockai, mayor of Asotthalom, a village of 4,000 people [in Hungary]. “We sympathise with those fleeing war zones – the Syrians and Iraqis – but less so with those fleeing poverty. Many have smart phones and follow their progress by GPS. Few of my constituents, whose doors they knock on in the middle of the night, can afford phones like those. I agree with those who claim that it is clear that Kosovo’s secession from Serbia, as well as its hasty recognition as an independent state, was a mistake. The current wave of refugees confirms that Kosovo cannot endure as a state. The insignificant economic base was easy to see when creation of the state of Kosovo was ongoing. Official statistics from year 2008 shows that export from Kosovo amounted about 200 million Euro while import increased to 2 billion Euro, which makes trade balance almost 1,800 million Euro minus. If export is covering some 10 percent of import so from where is money coming to this consumption. The estimate is that when export brings mentioned 71 million Euro the organised crime (mainly drug trafficking) brings 1 billion Euro, diaspora gives 500 million Euro and international community 200 million Euro. After bombing Serbia 1999 KLA (Kosovo Liberation Army) leaders changed their organized crime clans officially to political parties. This public image however can not hide the origins of money and power, old channels and connections are still in place in conservative tribe society. Last ten years now political leaders have whitewashed their drugs- and other OC-money by establishing façade-firms as well real enterprises, by success in donor funded investment projects and through privatisation process. The real power in Kosovo lays with 15 to 20 family clans who control “almost all substantial key social positions” and are closely linked to prominent political decision makers. German intelligence services (BND) have concluded for example that Prime Minister Thaçi is a key figure in a Kosovar-Albanian mafia network. Two German intelligence reports – BND report 2005 and BND-IEP report Kosovo 2007 – are giving clear picture about connection between politics and organized crime; both reports can be found from my document library under headline Kosovo. (For background see also my article Kosovo: Two years of Pseudo-state ). In the late 1990s Serbia was bombed by NATO for the purpose of Kosovo independence. Now the Kosovo people, the ethnic Albanians, under the EU/NATO/US umbrella, are fleeing Kosovo in droves. Ironically one would think, that after being bombed over Kosovo the Serbs would just let the peasants cross into Hungary and be the EUs problem. Besides since the EU wanted Kosovo to be independent, and Kosovo and Albania are candidates for EU membership, one would think the EU would be welcoming these Kosovo Albanians with red carpet. So what can be done? From my perspective everything went wrong when mid-90’s Germany and U.S. selected strategy to support Croatian Nazis, Bosnian jihadists and Kosovo Albanian mafia with their separatist intentions while same time demonizing Serbs. As result Croatia got independency, Bosnia-Herzegovina came artificial creature in Dayton and Kosovo as international protectorate. From year 1999 international community has squandered billions of euros for its state-building efforts and after 15 years Bosnia-Herzegovina is even more dysfunctional than before western interventions and Kosovo is transforming itself from failed to captured state. The way out in Kosovo in my opinion starts from first recognizing made mistakes while selecting sides and then cleaning old allies and present day ruling elite – organized crime clans – out from their administrative positions; EULEX rule and law mission could be good tool for this job. Only from this clean base the capacity building activities of state and local administration can be successful. The new start could lead into more democratic independent Kosovo, the outcome could also be renewed autonomy as part of Serbia, or integrating Northern Serb populated area to Serbia, or cantonization depending of interests of local stakeholders. Anyway each of these follow-ups from my perspective are better for Kosovo as well Serbia than situation today. 5. Kiev will declare a general amnesty for the rebels. 9. After the local elections are held in the Donetsk and Lugansk regions, Kiev is to restore control over their borders with Russia. The transition may take time, which would be needed for a comprehensive constitutional reform in Ukraine. 12. The OSCE’s election monitors are to see that local elections in the self-proclaimed republics are up to international standards. The exact procedure for the elections is subject to further negotiations. 13. Talks between the “contact group” will be intensified in various ways. Nearly a year after the massacre on Kiev’s Maidan left over 50 dead, the BBC has aired footage of an opposition fighter who says he fired at police in the early morning that day, bringing into question the popular narrative that riot police fired first. “I was shooting downward at their feet,” says a man the broadcaster decided to identify as Sergei. According to Sergei, he took up a position in the Kiev Conservatory, a music academy located on the southwest corner of Kiev’s Independence Square, on February 20. BIRN Under Fire :: BIRN. You are currently browsing the Conflicts by Ari Rusila blog archives for February, 2015.